Have you seen it? Amid winter’s darkness, spring’s sunshine is incrementally increasing. Enduring January always feels like a win. Winter’s grayness is not yet past, but we literally see and feel the light of spring. It’s like coming out of hibernation. As the days grow longer, my sense of urgency to accomplish goals grows stronger. One ever present roadblock to goal progress can be procrastination. Procrastination rears its ugly head in many ways every day and we often excuse it. But progress cannot be made when we justify procrastination. One of the best deterrents to this obstruction is improved mind and memory wellness. • Some things in life only we can do for ourselves- mind and memory wellness is one of them. • Motivation is crucial. Having a healthy mind and memory as we age should be a priority for all of us, no matter our age. • A positive attitude about wellness is key. Seize the day! There’s no time like the present to pay attention to mind and overall wellness. So let’s get moving! To encourage progress towards our wellness goals please join MemoryMinders for our Mindful Winter Warm Up. 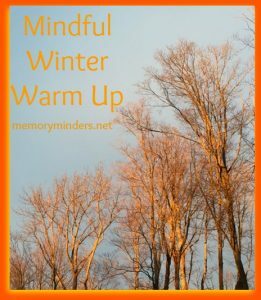 For the next 8 weeks through March, I’ll post strategies, research, and encouragement for our mind wellness every Mindful Monday. Having a healthy mind guides our overall wellness, so no more procrastination! Let’s warm up our minds as we look forward to warmer days ahead. To ensure you receive these posts each Monday, sign up here in the sign up box to have them emailed to you. Or like and follow MemoryMinders on Facebook, Twitter or LinkedIn. Here’s to no procrastination, mind wellness and continued progress on our wellness goals in the brighter days ahead!